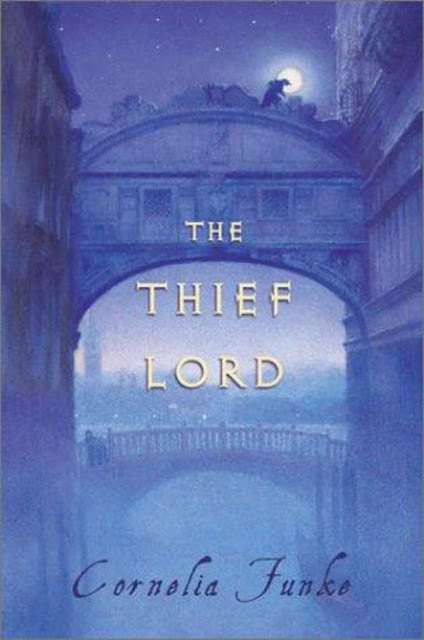 In the spirit of Charles Dickens' Oliver Twist, Cornelia Funke's children's novel details the adventures of two young brothers living among street thieves in Venice. Young Prosper and Bo have run away from home after the death of their parents. Knowing that their aunt and uncle want to separate the brothers, they decide to band together in hopes of living on the lam and making it on their own. Choosing to escape to Venice--their mother's favorite city--they quickly fall in with a group of pickpockets who live in an abandoned movie theater. The cast of characters and setting easily lures in the reader. Led by Scipio Massimo, the so-called Thief Lord, the youngsters learn how to fend for themselves and learn the life of living on the streets. Scipio's street gang includes the avid reader Hornet, young Riccio who still sleeps with a stuffed animal, and radio-fanatic Mosca. All of these orphans have found family in each other and guidance under the Thief Lord's direction. When Bo and Prosper's aunt and uncle hire Italian detective Victor Getz to track them down, he soon discovers their hiding place. In a comic turn of events, the children kidnap and imprison Victor, discover the Thief Lord's true identity, and are hired by an old man named Conte who needs the children to help him steal the key to recapturing his lost childhood. From here on, the story enters the realm of the fantastic and may lose some readers with its magical realism, but the setting never fails to paint a beautiful picture for the audience's imagination. Within minutes of beginning the novel, I knew I loved the world it had created. Funke's increasing dependence upon comic relief and the absurd made me question if she'd thoughtful constructed the plot beforehand or if she was making it up as she went. I mentally checked out once the young thieves and Conte begin to delve into the world of the mystical, childhood fountain-of-youth, but I really appreciated the novel's setting and its correlation to Dickens' artful dodger and company. I have this book but haven't read it yet. I'll have to read it.